I really hate it that I have to use all kind of different versions of OneNote. I have Windows 10, Android and iOS. Why not one version on all those operating systems? Chromebook, timeout occurs when typing in unlocked password protected sections. When updating my journal on Android version on a Chromebook, which is password protected, typing is interrupted by app applying the time out and needing the password to unlock the section again. It appears that even though I am typing it thinks the app has been inactive because I'm not touching the screen as I would be on a phone. The app needs to be aware that it is installed on a Chromebook and therefore should expect both only touchpad and keyboard interaction sometimes. I would like the option to set a default font. I wrote a note that switched between Calibri and Times News Roman six times. That's ridiculous. I have just started using Onenote for Windows (the new one) and Android. I want to turn off the pressure sensitivity of my s-pen (Samsung Galaxy Tab S4) and my Windows pen so that when I write the letters are of uniform thickness. With pressure sensitivity on, the notes look very distracting. This was not a problem on Onenote 2016 and other Android apps that I have used (Squid). Throw out OneNote, it's a joke of an app. I thought this was a good app and then three of my notebooks just disappeared. According to the app, I needed to login to sync my notebooks but I was already logged in. So I logged out and then logged back in - the notebooks apparently synced and the result was the loss of months of work. Microsoft Android apps thus far are below par quality - but I should not have expected any better as Microsoft have always released bug-ridden software. Now that all of my work is gone, so is this app. 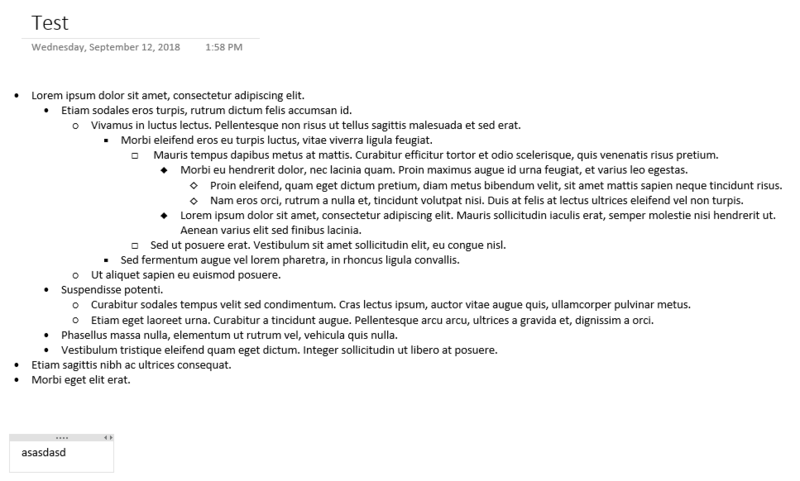 Need to be able to drag and drop Sections within and across Notebooks. Within a notebook, to re-order them and across notebooks to move a complete section from one notebook to another. I'm trying to use one not on my tablet android, but as soon it starts it shows the error 0xE0000648. It shows this error immediately, so before I can log in the app. It's of a big need to add the feature of editing Note Container's width and position for OneNote Android App like on Windows. I have long nested paragraphs with many subordinate paragraphs and long outlines. 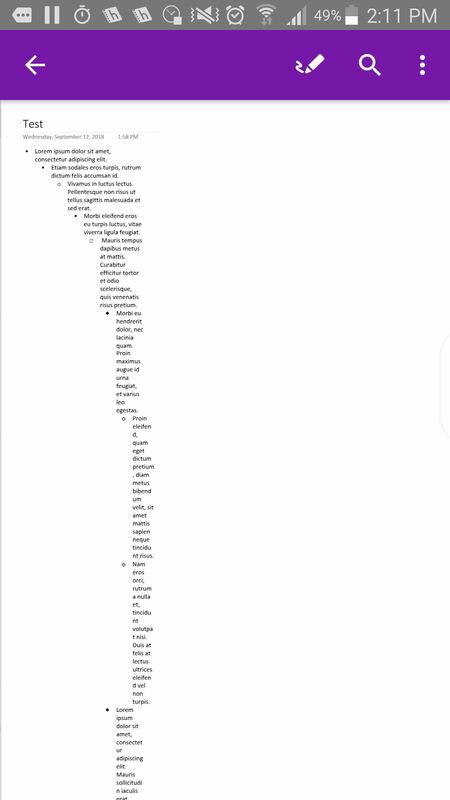 This makes the text not to be fitting good in the default small width of Note Container on the OneNote Android app. Below is attached screenshots (desktop_screenshot_1, android_screenshot_1) to show the difference of displaying the same notebook page on Windows app and Android app. A temporary trick I've tried is that I added another Note Container from the Windows app. 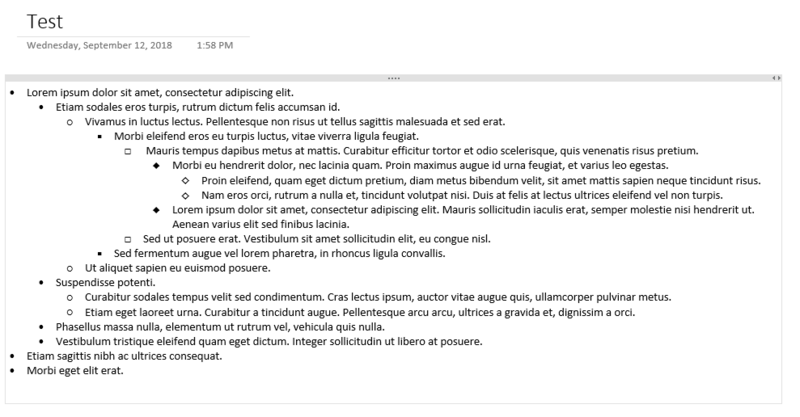 Surprisingly, this enabled the Note Container width and position editing on the OneNote Android app. Below is attached screenshots (desktop_screenshot_2, android_screenshot_2) to show the display of notebook page on Windows app and Android app after doing the trick. 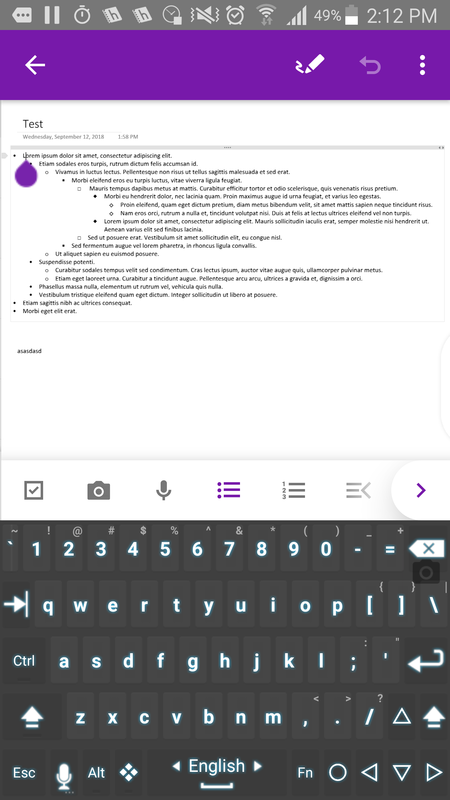 I hope the ability of editing Note Container's width and position for OneNote Android app could be available like on Windows. This would give us tremendous flexibility and power of being able to visualize and edit our long outlined notes effectively on our Android phones like on Windows Desktops. • android_screenshot_1: Note Container on Android (not able to control width and position in order to make more text fit more in each line and visualize notes better). • desktop_screenshot_2.PNG Adding another Note Container from Windows app. • android_screenshot_2.PNG The newly added Note Container helped enabling editing the Note Container width on Android app. This is supported among other MS Office products. Please don't just limit to Simplified Chinese. If you are using an active stylus (like the S Pen) there should be a way to draw with the pen but pan the note around using your finger. Every other note application on android has this feature. On Huawei Mediapad M5 Pro, the Huawei M-Pen has 2 buttons that are completely unutilized in OneNote. Please integrate some functions, maybe configurable by the user, like to swap from Pen to Eraser. OneNote for Wear OS is available but it crashes right after you open it. Looks like the last Wear OS update broke it. Fix? First of all, i like OneNote! but not on Andriod. There are some points which are horrible like the handwriting recognition, because there isn't one for the header. The Windows-version allows to handwrite the header but Android does not. And i can't understand why, because Android or Samsung, both come with built-in handwriting recognition. So that would be great, if you please add it!